Can you spot the real iPad charger? You probably don’t waste much thought on where to plug-in your iPhone, but not using a real Apple charger has its disadvantages. Not only are they higher quality, and safer, but they also charge faster than a 5W Chinese knockoff. Millions of cheap Apple copycats make it difficult to tell whether a charger is the genuine article and have been blamed on everything from iPad explosions to spontaneous electrocutions, but thanks to a teardown comparison from Ken Shirriff there’s one little flaw to look for that gives the dangerous fakers away. Just look for the signature. From the outside the iPad chargers in the picture above appear identical – different story when you bust the plastic open, but who has time for that? If you look closely you can see the real charger on the left has different text than Mr. Knockoff on the right. 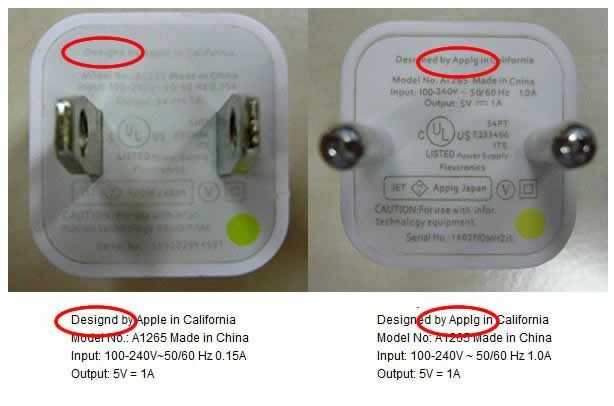 The counterfeit removed “Designed by Apple in California. Assembled in China” and the manufacturer “Foxlink”, probably for legal reasons. (But strangely, the counterfeit still says “TM and © 2010 Apple Inc.”) The counterfeit charger displays a bunch of certifications (such as UL) that it doesn’t actually have. 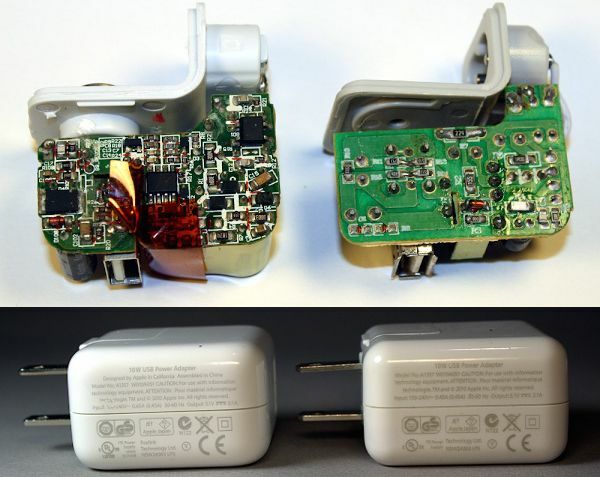 Shirrif’s teardown reveals there’s no way for the fake iPad charger to pass safety testing, but how do you spot an equally fake and unsafe iPhone charger that hasn’t passed safety inspections? Same method, only you might need a magnifying glass. Apple wasn’t just bragging about itself in last year’s horrible “Designed by Apple” ad. It was showing how its been marking its territory.